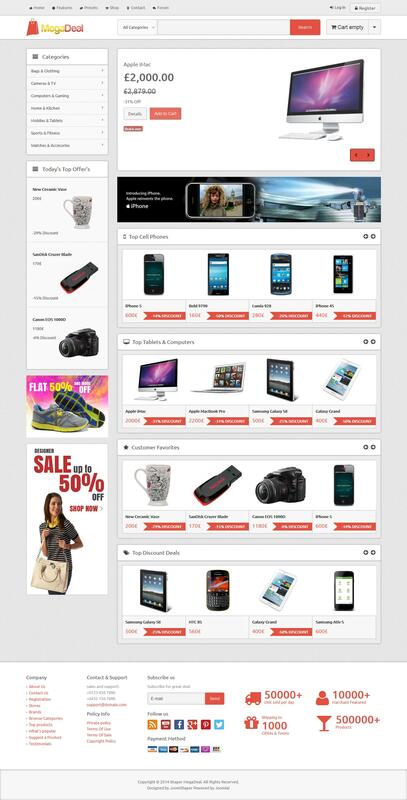 JS MegaDeal - elegant template online store, designed by professional designer studio JoomShaper. This template uses all possible functional component of online commerce VirtueMart, which can provide fast and convenient sale of goods through the site. Gorgeous design layout is designed with all the modern requirements, contains 6 color styles, and also includes light and dark design theme. To demonstrate the content store in the template adds additional expansion studio: slider goods SP Virtuemart Slider, stylish display module categories SP Virtuemart category module and site search SP Virtuemart Search. JS Shaper MegaDeal has adaptive properties, which are responsible for the support of any mobile platform.